Rangers were created to solve the problem of 16+ girls who did not want to leave Guides, but actually, as you might expect, it didn't really solve the problem at all, it simply deferred it a little longer - now it was a case of what to do about those who did not want to leave Rangers, especially since there was no upper age limit for Rangers, such that some members were well into middle age - yes, there are records of Rangers in their twenties, thirties and beyond, unless Ranger Leaders were firm about stating it was 'time to go'! Many Guide and Ranger Companies tried to keep in touch with former members whose lives were moving on with careers or husbands and families, particularly where there was a risk of this meaning their former members losing contact with active Guiding - but it was important that this was an extra sideline, and not to the detriment of the current active membership of the Ranger Company - the next generation of active young Rangers who needed to get their turn of being Ranger Patrol Leaders and taking charge of the running of their unit - or the need to have an attractive age-appropriate programme to encourage a steady flow of new recruits from the Guide Company. And although some former Rangers were able to go on to become Guiders, that wasn't an option for many due to their other commitments of work or family. By 1921, 'Branch B' of the Lone section had been created, catering for both Guides and adults who could not commit to attending regular unit meetings, through the medium of "study circles" - groups who would meet together to discuss topics of interest, but also would act as occasional extra helpers for units. In addition, unofficial 'old Guide' groups were springing up to deal with the problem of staying in touch with former members, and Guiding was looking more generally at how to deal with girls of Ranger age and above whose working hours prevented them from being active members of Ranger units. During the early 1930s there was long and anguished debate in "The Guider" on whether having Ranger units with an average age in the upper 20s (and some members in their 40s) was a problem, or not a problem! The various local clubs and groups for 'former Guides' spread to meet the demand. Such was the popularity that, by 1935, Guiding organisations across Europe had jointly published proposals for a 'Fourth Section' - and 'Old Guide' groups of various sorts were being set up across the UK, and in some cases seeking official registration and recognition at headquarters - and a headquarters "Recorder" had been appointed to deal with them. Some were for the former members of a particular unit, whereas others covered any former Guides who were living in a particular District or even County, regardless of where they had originally done their Guiding. They tended to follow the format of school 'Old Girls' groups, with both social meetings for the members, and invitations to attend or help at local Guide events. They might also provide a 'service team' of extra staff or instructors for unit activities and camps. In 1936 there was a proposal for more formal groups to be set up, and the name suggested by Baden-Powell for them was 'Guidons' - but unlike his name ideas for other sections, this name does not appear to have caught on. Each group was encouraged to have a 'Recorder' who acted as secretary and organiser, and the Recorders were asked to keep in touch with the 'Old Guides Recorder' at Headquarters and send regular updates of their activities. There was also an occasional column in 'The Guider' publishing these reports - they seem to suggest that programmes were generally a mixture of social meetings, outings, and backroom support of unit activities such as doing the teas at unit fundraisers - so the origins of being allocated that particular chore really do go right back to the beginnings of Trefoil Guild . . . ! In 1937 the first national "Old Guides" conference was held. They chose to have a special tie, in navy with red and green stripes, but opted not to have a special Promise Badge for Trefoil Guild, as members already had Promise Badges from their Guiding membership. In 1938 it was announced that Old Guides Recorders would be warranted, and would be entitled to wear the Secretary badge - and any Old Guide who had been a Commissioner, Secretary or Guider could wear the Old Guide Cockade in uniform. By 1943, things became more organised, formalised and official, and a new name was chosen - "Trefoil Guild" - designed as a group which was partially attached to the Girl Guides Association, and which supported the aims and methods of the Association, yet was independent from it (which brought certain benefits for both the Guild and the Association). 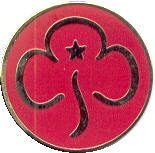 A special Promise badge was brought out, featuring a trefoil with a red-enamelled 'Trefoil Guild' scroll beneath. Trefoil Guilds gradually spread across the Country, with 'unit' groups gradually tending to merge into groups which covered a local area, and which welcomed all former Guiding members who were living in that locality. Soon some specialist groups were set up, such as the Scottish Handcraft Circle, which started in 1945, and the Golf section, in 1966. A swimming club and bowls competition were also established. In July 1951, the first Trefoil Guild magazine, "Notes and News" was produced, as a half-yearly bulletin, price 2d. Within a year it had increased in size, and in price, to 3d! It was later renamed "The Trefoil", and also available in braille and recorded versions. In 1953 a new armlet of red fabric was produced, with "Trefoil Guild" embroidered in yellow, which could be worn when helping at Guide activities. The first Trefoil Guild Conference was held in Swanwick in 1951, and following this, the constitution was ratified in 1954, with a central office at Commonwealth Headquarters being set up in the same year. It was in 1962 that Trefoil Guild 'Fellowship Day' was established, now marked on 25 October each year. Guilds were also set up to cater for 'Lones' who were not able to access the meetings of local Guilds through distance, timing of meetings, or mobility issues of whatever sort. A 'Travellers' Guild' was also set up, to cater for those former Guides who had nomadic lifestyles, which enabled them to retain their membership and attend any Guild meetings around the country that they could as visitors, and otherwise being able to stay in touch with the movement despite their wanderings. In more recent years an internet guild has also been set up, allowing connection between members who find this the easiest way of keeping in touch with Guiding. Trefoil Guild are now members of Girlguiding UK, and female Guild members can make a Promise, but they do not have a uniform (some logo'd garments are available for those who wish to wear them, shown below, but they are definitely optional. Some Guilds choose to have group items such as sweatshirts specially made, but again these are not official or 'uniform'). Men and Women are welcome to join. Guilds tend to meet once or twice a month, and have a range of outings, guest speakers and activity sessions. Some are involved in ongoing local service projects such as running uniform depots or exchanges, maintaining archives, maintaining camp stores, acting as activity instructors, acting as backroom staff at County events etc, and giving occasional help to units with special projects. They may take part in challenges or other activities in common with mainstream Guiding, and may help out at special events. Nationally, they provide starter packs of equipment to new units, and where possible are encouraged to stay in touch with the new unit thereafter and offer the benefit of their skills and experience. The programmes of individual Guilds tend to depend almost entirely on the age group and interests of their members, as although members can be aged from 18 upwards, membership in many Guilds is concentrated amongst the over-70s - those who have retired from being active as unit Guiders. In recent years 'Youth Guilds' or 'Active Guilds' have been created in some areas, where the programme and set-up is targeted to encourage younger adults who enjoy (or are capable of) a more active programme, which may be a reflection of this difficult and delicate issue. 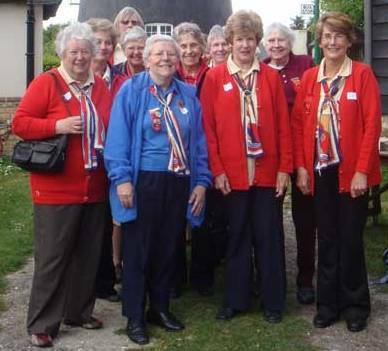 Some Guilds have also been set up to cater for Guiding members with special needs who are over 26 (and thus have to leave Senior Section) and are not in a position to become Leaders, but wish to continue their Guiding membership, meeting as a group and taking part in Guiding activities together. 2013 was celebrated as the 70th birthday of the section, with a range of special events being held to mark the anniversary, and 2018 brought celebration of the 75th anniversary, with souvernirs and a challenge pack. It also brought a potential boost to the youth membership numbers - with the Ranger age group upper age limit reverting from 26 to the 19th birthday, a number of Senior Section units where the membership are over 18, are considering converting to being Trefoil Guild groups. In 1971 the minimum age for Trefoil Guild was lowered from 21 to 18, and in 1973 a special group, 'Link' was set up for younger members aged 18-30 from both Scouting and Guiding. the idea had originated with Lady Alport, the then President of Trefoil Guild, to create a group which would link ex-Rangers and ex-Ventures. Discussions took place between the Girl Guide and Scout Associations with a view to forming a joint support group for the new section, unfortunately due to a difference of opinion this was rejected by the Scouts. 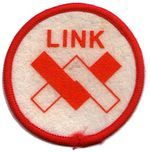 LINK began as part of the Thinking Day celebrations in 1973, with their own special badge. Lady Alport was invited to be LINK's honorary president in 1977, a position she held until her death in 1983. LINK held two annual get-togethers each year, in the Easter and August holidays, each hosted by a different LINK group. The idea was to provide a voluntary club where former members of either Association could take part in adventurous activities and voluntary work. Each LINK set up it's own programme and the aim of LINK was that it would be a Guide-Association based organisation which would help the Guide Association in a range of active ways, whilst also giving social and outdoor activity opportunities to it's members. Although the idea of a youth section for Trefoil Guild was welcomed, membership of LINK tended to be confined to a few enthusiastic groups, who often struggled to attract new younger members. LINK eventually closed down in 2008, with the members being absorbed into the Trefoil Guild. SSAGO is the Student Scout and Guide Organisation. It was officially founded in February 1967, but it’s roots go back further than that . . . Naturally, many of the students going to University, even from comparatively early on in Guiding and Scouting history, had been Scouts or Guides. The earliest records traced to date are in 1915 for University Scouting clubs. Among the first were Oxford, Cambridge, Manchester and London. Each of these was an independent club whose members linked in to the movement locally, and took part in activities alongside local Scouting/Guiding members. The first records of inter-club activities can be traced back to the publication in 1919 of a magazine for all “Intervarsity Scout Clubs” run and edited by Oxford. There were also Intervarsity camps between 1920 and 1927. Most of the members would have been Rover or Senior Scouts, or Ranger Guides. The independent clubs at each university carried on through the war years, despite the disruption, and the postwar rush of students into universities brought forth fresh enthusiasm for the clubs. The Birmingham club resumed the rallies which had stopped some 20 years before, with a camp at Beaudesert in the summer of 1947 which incorporated a conference. This was followed by events in the following two years, this time organised by Scout headquarters. In 1950 organisation of the rallies was again taken on by the clubs, who have continued to organise almost every rally. At that time the number of Universities in the UK was low (around 20-30) and colleges were not admitted to membership, other than a small number of specialist colleges such as Loughborough. In 1956 the Federation of Scout and Guide Clubs in Training Colleges was formed, and soon became Intercollegiate. In 1957 the Scout and Guide Graduate Association started, to cater for former students who had graduated. It was in 1964 that talks began with a view to starting a single Student Scout and Guide Organisation. It was prompted by changes to higher education, which was moving to a higher number of Universities, and a lower number of Colleges than before. Agreement took time to reach, but was achieved, and the new name chosen at the AGM in February 1967. It was at a key time for Guiding and Scouting in general, with both movements making radical changes to their programmes for all sections in order to bring them more up-to-date. Although a new group had been formed, it took time for it to establish an identity. Finances were difficult and a number of events were cancelled, or suffered from low attendance. Although on paper the membership was high, at some institutions all student union members were automatically deemed to be members of all the clubs, thus high numbers were not a true reflection of the active membership. In the mid-1980s Scouting for students underwent another review with the publication of “Scouting and Education”, which proposed that SSAGO should be extended to 16-18s, responsibility would pass to Counties, and the central committee closed. However the project was mothballed and the eventual outcome was minimal change. In the 1990s SSAGO moved forward, with rallies attracting higher numbers and renewed interest. Another Scouting Review launched in 1996, which for several years again cast doubt on the future of SSAGO, which was finally resolved in Summer 2001. Since that time SSAGO has continued as an independent organisation which supports the aims of Scouting and Guiding. Membership is available to students at a College or University which has a SSAGO club, or students can join as an Independent member. Rallies are held once a term, each hosted by a separate SSAGO group around the UK. Numbers are usually around 100-250, and each has a theme chosen by the organisers.